Lightning strikes are considered medical emergencies due to their potentially fatal damages to the cardiac, respiratory and nervous systems. Lightning strikes are not uncommon and in fact belong to the top five weather-related emergencies. Most lightning strikes occur while doing recreational activities in the outdoors such as, playing sports, swimming, boating, fishing and being in an open field. What are the Different Ways Lightning Strikes People? Although it cannot always be certain how a person has been struck by a lightning. Most people think that direct strike is the only way to be injured from a lightning strike, however, there several other ways. What Complications Can Arise from Lightning Strike? Complications can range from being minor to very fatal. How is First Aid Given to Victims of Lightning Strike? Move the person from the open field or other dangerous area only if it is safe and necessary. Check for first aid’s ABC’s. If there is no breathing and no pulse, initiate CPR immediately. If one does not know how to perform CPR, the dispatcher from the local emergency number can give instructions. CPR consists of 30 chest compressions and 2 rescue breathings. 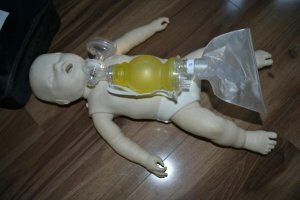 CPR can be applied in many emergency situations. To learn how to give proper CPR to victims of different emergencies, such as lightning strike, enrol in First Aid Courses and CPR training.